ASP.NET has the infamous yellow screen of death. Rumor is that it was written by “The Gu” himself. It is an incredibly useful page that allows you to quickly and easily determine why stuff went wrong, while debugging your code. You get a stack trace, including the line of code and context for your error. There is a slight snag though. When diagnosing SQL errors this page is lacking. Even though you are provided with the exception SQL Server returned, you do not get the SQL that executed nor do you get the parameters. Often I found myself setting break points and attaching, just to get at the SQL. This is very wasteful. So I thought … why not extend the error page. Turns out this is fairly tricky. There are two very big problems. Firstly, DbException and derived classes do not have any idea what the CommandText is. Secondly, extending the yellow screen of death is totally undocumented. The custom DbConnection we use with MiniProfiler makes tracking the failed SQL simple. Next we implement a class that intercepts the exceptions and logs the SQL. During debug we now make sure we use RichErrorDbConnection as our db connection. The trick here is that we use a string replace to yank in the new chunk of html. I hope that future releases of the platform make both of the hacks easier to implement. It would be awesome if MVC4 shipped a template error page you can just edit. It would be awesome if the base ado.net interfaces provided a means of interception without needing a full re-implementation. EDIT Just updated the code sample following the comments by Keith Henry and Nigel, thanks! Could you not have caught the exception and rethrown it with a new Exception appending the sql to the message and passing the original exception in as the inner exception??? yeah I did that originally … very risky, strongly recommend against. We have internal code that handles stuff like SqlException deadlocks etc, wrapping it up means you now have to check for another exception type. Also, it is much less readable than my screenshot. Probably, but you would need to extend the provider wrapper or hack some MiniProfiler internals. Thre seems to be broken link to MiniProfiler â€“ or am I missing something? Surely you test your SQL queries in SQL Server Manager before copying them to your stored procedure? Makes this suggestion redundant. @Darryl: of course you test your sql queries but the value of this suggestion isn't that it will show you broken sql statements, you should have caught those before release but data issues. when you can see the values of the parameters causing the issue, you can take that offline and inspect why it becomes an issue. You might want to use the RaiseError within the SQL. This will produce the exact same messeges without all the changes you have provided. You will have to surround your SP in this case with a try and catch. I am failing to see how this would help, for one it requires extensive changes throughout your codebase that would probably effect production. Excellent idea, but couldn't the SQL detail be a property of the exception rather than in the global HTTP cache? 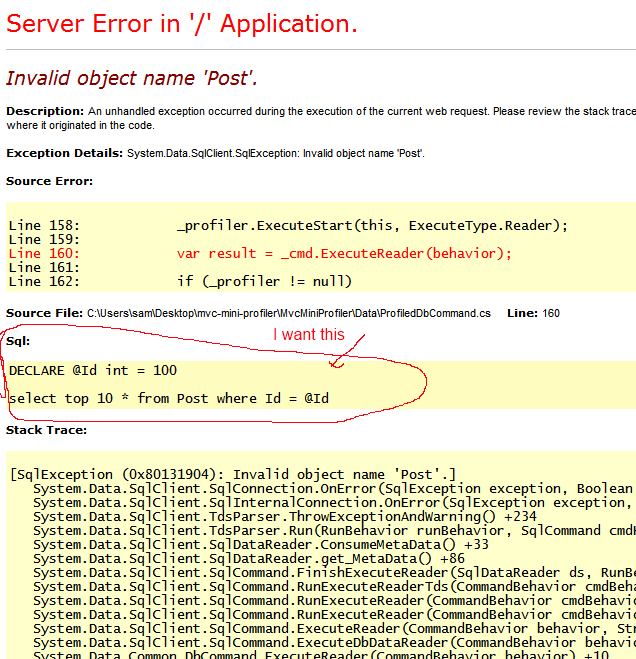 Then in Application_Error you'd read lastError.Data instead of the HTTP page cache. This would be more extensible too, as content other than SQL could be added for other calls. One other small thing â€“ you've called Server.ClearError(), so now the page can continue processing but without the error set. This results in the page having a 200 HTTP status code, instead of a 500 one, and other page processes still continuing. be in the catch not the try block?